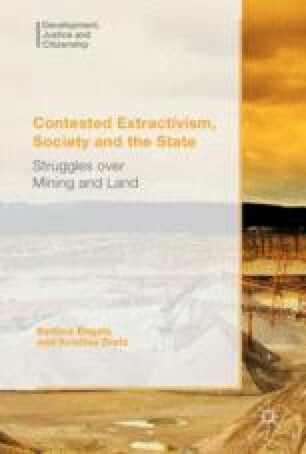 This chapter explores the spatial dynamics of extractivism beyond a state-centred analysis based on the dichotomy between resource-dependent and industrialised societies. Its aim is twofold: to outline the analytical biases and spatial omissions that the widespread Latin American literature on extractivism presents, and to lay the foundations for a framework that focuses on the significance of spatial categories for politico-ecological research on extractivism. Embedded in the field of political ecology as well as critical space theory, I aim to bring the scholarly imagination back to the task of exploring analytical categories in order to boost empirical research on the spatiality of extractivism and to gain a better understanding of the contentious politics of extractivism. CEPAL (2014). Pactos para la Igualdad. Hacia un futuro sostenible. http://www.cepal.org/publicaciones/xml/7/52307/2014-SES35_Pactos_para_la_igualdad.pdf. Accessed 23 May 2014. Foucault, M. (1984 ). Des espaces autres, Architecture, Mouvement, Continuité (trans: Blitstein, P. & Lima, T.). N° 5, http://yoochel.org/wp-content/uploads/2011/03/foucalt_de-los-espacios-otros.pdf. Accessed 10 Oct 2015. Gudynas, E. (2009). Dies tesis urgentes sobre el nuevo extractivismo. Contextos y demandas bajo el progresismo sudamericano actual. http://extractivismo.com/documentos/capitulos/GudynasExtractivismoSociedadDesarrollo09.pdf. Accessed 10 June 2015. Gudynas, E. (2010). The new extractivism of the 21st century: Ten urgent theses about extractivism in relation to current South American progressivism. Americas Program Report. Washington, DC: Center for International Policy, January 21. www.americaspolicy.org. Accessed 6 Apr 2016. Gudynas, E. (2013). El extractivista más grande del continente: Brasil. http://www.alainet.org/es/active/63900. Accessed 16 Jan 2016. Mezzadra, S., & Gago, V. (2015). Para una crítica de las operaciones extractivas del capital. Patrón de acumulación y luchas sociales en el tiempo de la financiarización. Revista Nueva Sociedad, No. 255, enero-febrero de 2015, ISSN: 0251-3552. www.nuso.org. Accessed 3 Mar 2016. Svampa, M. (2012). Consenso de los Commodities, Giro Ecoterritorial y Pensamiento crítico en América Latina, Revista OSAL Observatorio Social de América Latina, XIII(32). http://biblioteca.clacso.edu.ar/clacso/osal/20120927103642/OSAL32.pdf. Accessed 15 May 2014. Svampa, M. (2013), «Consenso de los Commodities» y lenguajes de valoración en América Latina en Revista Nueva Sociedad No. 244. http://www.nuso.org/upload/articulos/3926_1.pdf. Accessed 23 May 2014.